Picture a member of the Provisional IRA and you won’t be alone in imagining a balaclava-clad man in his twenties or thirties. Think again. 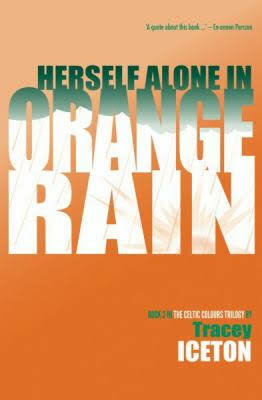 ‘Official numbers are small but unconfirmed accounts report a 50-50 male-female attendance at IRA training camps,’ Iceton tells us in the author’s note of Herself Alone in Orange Rain. Women were active volunteers in the IRA and they died in the troubles and this novel, with its ‘blend’ of fact and fiction is testament to that. 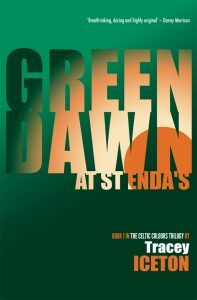 Dawn at St Enda’s is set at the time of the Easter Rising, the main action of Herself Alone takes place during the troubles of the 80s. The protagonist is Kaylynne Ryan, an art student who has grown up with middle class hippies in London. When she finds out who her real parents were and meets her belligerent but doting grandfather who is still active in the IRA despite his ill health, she changes her name to Caoilainn, and becomes embroiled in guerrilla warfare. The name change is symbolic as well as literal. ‘‘He says ‘Kee-lun!’ not Kay-lin’. The syllables buffet me,’ she tells us on p.18. Caoilainn, like Northern Ireland itself, is a hybrid and she is destined to be buffeted from every angle by the choices she makes. Iceton uses Gaelic and dialect sparingly and to good effect although she doesn’t make you grapple with the language as you might with Wuthering Heights or an Irvine Welsh book, instead giving definitions in footnotes. The use of language feels naturalistic, Herself Alone… being an appropriate title both for its Irish lilt and its denotation of Caoilainn’s outsider status that is evident both in England and in Northern Ireland. At Plymouth School of Art and Design she feels displaced amongst her privileged fellow students, reflecting, ‘they don’t get….people like me’. Yet, on arriving in Northern Ireland, she is a Brit who knows of the situation only what she has seen on the BBC. I came uneasily to this book as many British readers will, not just because I remember the scares and the blasts on the screen but because, as Brits, we were cast on the opposing side. From a more personal perspective, my dad was posted to Northern Ireland three times during his army service and I recall tearful farewells at the airport not knowing if or when I would see him again. I suppose in that sense I was involved in the troubles too, albeit in an indirect and protected way. Through Caoilainn’s training with the Provisional IRA, through the lengths she will go to once they take her on and because of her family ties, she is gradually assimilated into the organisation and the community that supports it. Caoilainn is physically brave, impulsive and strong, she is bloody-minded, loyal to those around her and to the cause she has chosen. These are qualities we expect from a literary hero. However, I found many of her actions questionable, sometimes making it difficult to empathise with her. Her rejection of the parents who had brought her up, though minor compared to later events, felt callous. But most shocking was her readiness to jump into ruthless violent action without what I felt was a strong personal motivation or depth of understanding of the political situation. This aspect of her character was reminiscent of Doris Lessing’s Alice in The Good Terrorist. Yet it wasn’t unrealistic. Caoilainn is a young person with nothing to lose, desperate to belong somewhere or to something. Last year I was working on a short story and wanted a female rescuer as protagonist. It occurred to me I had rarely seen accounts of women rescuing people. Now I know this isn’t because cases don’t exist. A friend of mine lost his mum when he was young because she was saving him from drowning and (in a much less significant action) I once placed myself between two arguing men, one of whom had a knife in his hand. I Googled ‘hero’, ‘woman’, ‘rescue’. Sure enough, any combination of these words, usually found in newspaper articles, brought up women as the recipients of rescue. We desperately need female heroes, I thought, not particularly originally and not for the first time. Every rookie novelist knows that a protagonist must have a lot at stake. The troubles grip Caoilainn tightly, the childhood loss of her parents spelling only the beginning. Despite her efforts and successes in attaining equality with the male volunteers, she has a woman’s body and encounters terrible choices that a man in the same situation would not have to face. I don’t want to give any spoilers but ultimately Caoilainn loses almost everything she has come to value. Yes, Herself Alone is not a book that chooses between character and plot and there is no shying away from the brutalities committed and endured. But by the end none of it is clear-cut, even for Caoilainn. The side you are on is, to some extent, down to luck. They stopped being men when they were hauled from the car, becoming tumours to be ripped from Belfast’s belly, monstrous and malignant, oozing the putrid pus of our either Hundred Years’ War. Now they lie like fresh-picked scabs, bloodied and ragged around the edges. But they’re not the cancer to be cut from our hearts; they’re a symptom, not the cause, of our pain and rage and fear: they’re victims of it as much as we ourselves (p 375). Is Caoilainn the type of female hero we want? Perhaps not. But she is the one Iceton gives us and she is reflective of women in complex political situations who believe some things are more important than civilian lives and who are prepared to act in anyway necessary to achieve their aims. Iceton gives us the chance to imagine ourselves in their shoes, something we need to do if we are going to tackle the problems that face us now. I’d really like to read this Becky. Thanks for such a detailed and thoughtful review, which refers to the novel’s (and yours) moral dilemmas.